Stanford takes top prize for being the most difficult MBA program to get into. Per US News it has a daunting 5.7% acceptance and the highest average GPA and GMAT score for the class that entered in Sept. 2017 of any U.S. MBA program. No wonder it tops Accepted’s B-School Selectivity Index. In terms of placement, Stanford GSB grads are prized, and rewarded handsomely. Its Class of 2017 started their careers with an eye-popping average annual salary of $159,440, second only to Wharton’s $159,815. Furthermore, 16% of Stanford’s MBA grads started their own business immediately upon graduation. In terms of its application, Stanford is once again re-using its essay questions. And there’s good reason for the recycling: These are excellent questions that succinctly get to the heart of what Stanford wants to know about you. They are not easy questions, but they are thoughtful, probing ones. Stanford gives a lot of advice and guidance on its website as to what it’s looking for in the essays. You should access that advice in addition to reviewing my suggestions below. My tips are in blue below. Essays help us learn about who you are rather than solely what you have done. Other parts of the application give insight to your academic and professional accomplishments; the essays reveal the person behind those achievements. When writing your essays, our best advice is simple: answer the question. Resist the urge to “package” yourself into what you think Stanford wants to see. Doing so will only prevent us from understanding who you really are and what you hope to accomplish. The most impressive essays are the most authentic. We request that you write two personal essays. In each essay, we want to hear your genuine voice. Think carefully about your values, passions, aims, and dreams prior to writing them. Stanford MBA Essay A: What Matters Most To You, And Why? • Do some deep self-examination, so you can genuinely illustrate who you are and how you came to be the person you are. • Share the insights, experiences, and lessons that shaped your perspectives, rather than focusing merely on what you’ve done or accomplished. • Write from the heart, and illustrate how a person, situation, or event has influenced you. This superficially straightforward question has been Stanford’s first for at least the last sixteen years, but it is actually one of the most difficult, if not the most difficult MBA essay questions to answer. Superficial responses will fail. The prompt demands introspection. Before you put finger to keyboard or pen to paper, really reflect on what you value, how you have acted upon those principles, and why you live by them. Stanford’s advice urges reflection. The question requires it. When I reflect on our many successful Stanford clients, initiative in the face of need is the common thread among them. They are always the ones who revealed, especially in Essay A, that they do not turn away when they see a problem or need for action. They grab the initiative when faced with an opportunity to contribute. They are comfortable expressing emotion and their values, and their actions reflect both, but particularly the latter. Think purpose-driven, principled lives and leadership. More than anything else, initiative and self-awareness characterize the successful Stanford MBA applicant. Implication: You have to know your values and those times you have acted upon them. Yes I wrote that a few seconds ago, but it bears repeating. Climbing Mt. Everest or suffering from terrible social ills is not a requirement of admission, but you do have to know the person occupying your skin. Stanford MBA Essay B: Why Stanford? • Explain your decision to pursue graduate education in management. • Explain the distinctive opportunities you will pursue at Stanford. • If you are applying to both the MBA and MSx programs, use Essay B to address your interest in both programs. Now that question is succinct, and really says what they want to know. This question is a variation of a standard MBA goals question, as revealed in the bullet points after it. For this forward-looking question, you need say why you want an MBA. The best way to do so is in terms of your desired post-MBA professional direction. Then explain how Stanford’s program specifically will help you travel down that path. Note the bullet point about the “distinctive opportunities you will pursue at Stanford.” Do your homework. You need to know what are the distinctive characteristics of the Stanford MBA program or you simply can’t answer the question. Please do NOT write that you want to attend Stanford because of “the flexibility inherent in Stanford’s curriculum, its integrated approach to management, its entrepreneurial culture….” That phrasing is too general for your specific reasons (and besides the Stanford adcom can google the phrase if they see it too often and see that you found it here). Go deeper and be more distinctive in your writing so that you really tie your goals to different facets of Stanford’s MBA program. Stanford also asks that if you are applying to both the Stanford MBA and MSx programs, you use Essay B to address your interest in both programs. It gives those applying to both programs an extra 50 words to address that interest. Essay Length: Your answers for both essay questions combined may not exceed 1,150 words (1,200 words if you are applying to both the MBA and MSx programs). Each of you has your own story to tell, so please allocate these words between the essays in the way that is most effective for you. Below is a suggested word count, based on what we typically see. Be sure to save a copy of your essays, and preview the uploaded document to ensure that the formatting is preserved. 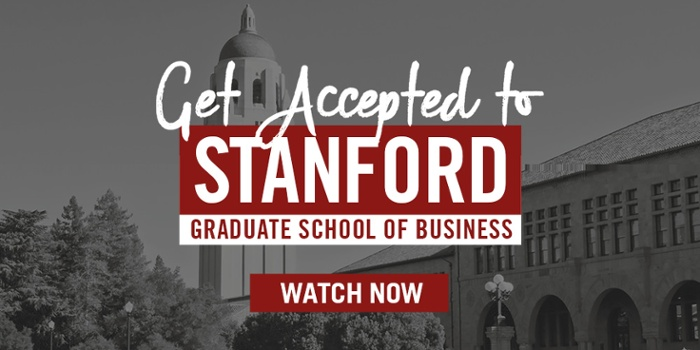 For expert guidance with your Stanford MBA application, check out Accepted’s MBA Application Packages, which include comprehensive guidance from an experienced admissions consultant. We’ve helped hundreds of applicants get accepted to Stanford’s MBA program and look forward to helping you too!